THE B-MOVIE NEWS VAULT: Sam Raimi's Horror Classic, THE EVIL DEAD, Makes the Leap to 4K Ultra HD on October 9th! Sam Raimi's Horror Classic, THE EVIL DEAD, Makes the Leap to 4K Ultra HD on October 9th! "THE EVIL DEAD" RETURNS IN YET ANOTHER NEW HOME VIDEO RELEASE! Egads! I have purchased the entirety of the EVIL DEAD franchise in various formats over the years, and it looks like I may end up doing it again! Raimi's classic original makes its debut on 4K Ultra HD, though it is far from being a definitive release. I guess that means that we'll eventually get a "Deluxe Edition" that is packed with extras, and most likely a 4K release of EVIL DEAD II in the near future! Synopsis: THE EVIL DEAD, director Sam Raimi’s (DARKMAN, THE QUICK AND THE DEAD, ARMY OF DARKNESS) first feature film, is a true cult classic in every sense of the word. Originally released in 1982, THE EVIL DEAD tells the tale of a group of friends who go to a cabin in the woods, where they encounter an unspeakable evil lurking in the forest. They find the Necronomicon Ex Mortus ("The Book of the Dead"), and the taped translation of the text. Once the tape is played, the evil is released. One by one, the teens become deadly zombies. With only one remaining (Bruce Campbell - Ash vs. Evil Dead, BUBBA HO-TEP, MANIAC COP), it is up to him to survive the night and battle THE EVIL DEAD. Audio Commentary with writer-director Sam Raimi, producer Robert Tapert, and star Bruce Campbell! While I'm sure many fans will snap up this release, I'm sure that some will be disappointed by the lack of an original Mono audio track, and dearth of special features. 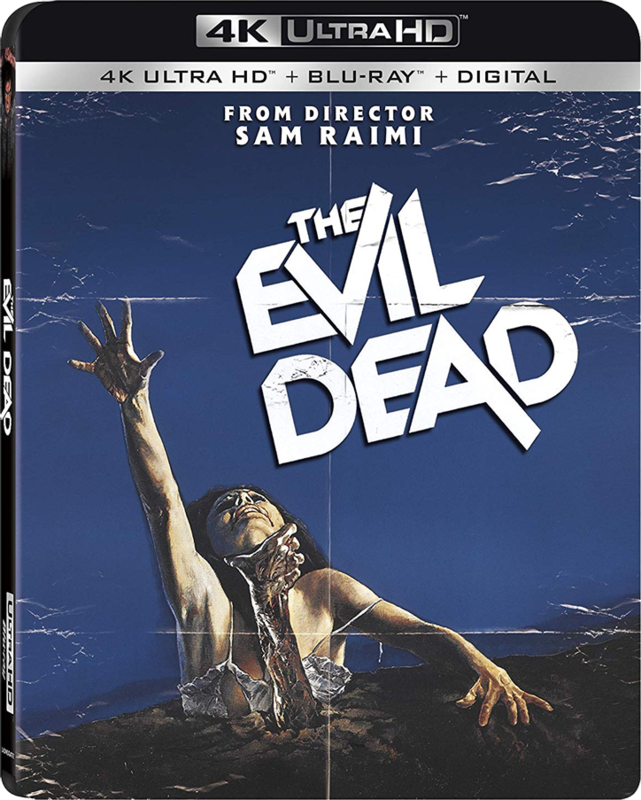 Still, the draw of seeing THE EVIL DEAD in twice the resolution of its previous Blu-ray release is hard to pass up, especially since this disc only costs between $16 - $18! You can order a copy of this 4K Ultra HD release now from AMAZON, BULLMOOSE, or DIABOLIK DVD!